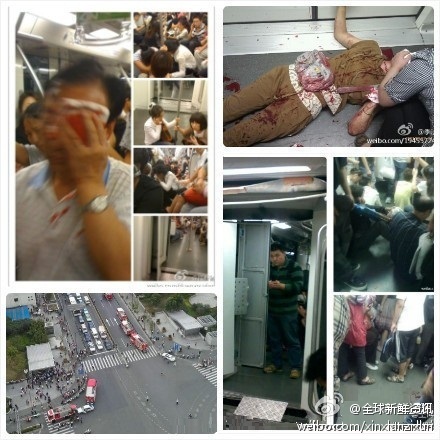 Today there was a collision between two trains on Shanghai subway line 10. Some very bloody pictures emerged from the scene and now the number of injured has been reported at 224, 20 of them seriously hurt. No deaths so far. According to early reports, there was a failure in the signaling system at around 2:30 so the li ne switched to manual signalling. Then at around 3:00 one train rear-ended another. One of them (probably the one that was hit) had allegedly been sitting at Laoximen station for 30 minutes. Caixin has reported the signaling system was made by a company also involved with the system in the Wenzhou train accident that killed 39 people and also used in subways in a number of other major cities. Making things worse is a report from 2005 that’s been discovered bragging about how there will never be a collision thanks to Shanghai’s advanced signalling system. Early signs show that the government doesn’t intend to create an aftermath debacle like with the Wenzhou accident. Reporters are being given access to the scene, and Shanghai metro jumped out in front of the issue with what appears to be a very sincere, responsibility-accepting apology. [Update: They’ve actually posted two apologies which were subsequently deleted. Both are available at this Shanghaiist link]. But no matter how well the aftermath is handled, it’s going to be bad. Man: I’m so glad you weren’t poisoned (to death) by gutter oil, Sudan red, lean meat essence, or toxic buns! Your house didn’t catch on fire! The bridge in front of your house didn’t collapse, right? You’re so lucky that the escalator didn’t malfunction when you went to work! It’s wonderful! We survived another day! Woman: I was so worried you’d get run over by someone supposedly going 70 kph on your way to work! Or get stabbed eight times in a row! My gravest fear was that you would be accidentally injured by chengguan who were beating up someone else! I was also worried you would need to ride the high speed train! But I didn’t dare to call you, because I was afraid your cell phone would explode! Recently the picture to the right made rounds on the Chinese internet (translation by Danwei). Everything the couple says alludes to some danger that’s common in China or has happened in recent months demonstrating how people were already on edge about the safety of their food, products and especially their transportation. If it’s true that subway operators voluntarily switched to manual signaling and the crash happened almost immediately after, that would appear to be an act of Wile E. Coyote incompetence that even the Wenzhou accident couldn’t match. Whether there’s anything sketchy with the companies, officials or operators involved isn’t yet known and may not be fully known. But what really happened isn’t nearly as important as what people perceived happened…and if Weibo is any indication, many already assume the worst. That this happened in Shanghai is especially damning. Last November a fire engulfed a residential building in the city killing 58 people. It was found that corruption was definitely the cause and involved everyone from contractors and welders to government officials. In the end 26 were charged. Then there was former Shanghai mayor Chen Liangyu who was ousted in 2006. He had been the highest player in a Shanghai cesspool of corruption and misuse of power at the time, and one of the highest officials to ever “fall off the horse” in China. I remember once while I was walking on the street in Beijing with my girlfriend I stepped in a gaping pothole. “It’s probably there because of corruption,” she said laughing. She wasn’t really kidding though. In a culture that breeds corruption through lack of accountability and independent supervision at every level of society, there’s no telling what damage it does, what safety regulations get ignored, what corners get cut, which important jobs are given to horribly unqualified people, or what sensitive public works contracts are given to companies that can’t deliver. The Shanghai building fire represented a compounding of common corruption at many different levels that came together in a perfect storm. There may very well be no foul play involved in this subway crash, but if that’s the case, good luck selling it to the public. As the one Weibo commentator noticed, things like this don’t tend to happen in many other countries; at least not with the frequency that they do in China. And with an unbroken string of safety issues in the past year directly attributable to corruption, suspicion in this case will be unavoidable and nearly impossible to pacify. It will be one more straw on the camel’s back of a public that’s been incredibly patient with a system whose transgressions (and attempts at covering up those transgressions) are becoming more and more visible, and seemingly more and more frequent with the emergence of tools like Weibo. People are seeing the harsh details of the system that’s screwed its people in every imaginable way, with the exception of providing raw economic growth. Those content with the system the way it is had better hope that growth lasts forever. As more of the world’s sensitive activities and information travel through the wires of the internet, vulnerability to distant hackers is unavoidable. China can’t be blamed for feeling especially susceptible as an emerging power with the world’s highest internet population. But over the past few years, an interesting countermeasure has been discussed from time to time in the Middle Kingdom: Building an independent Chinese internet. A June 21st Global Times article said, “90 percent of people believe China should strengthen its cyber defenses and build its own internet system.” This was based on a phone/online survey by the Global Poll Center affiliated with Global Times. Wording and/or sampling bias probably played a role in that unusually high 90 percent figure, but we’ll assume that a significant number of Chinese do think an independent internet is a good idea. Iljitsch van Beijnum, research assistant at Institute IMDEA Networks who’s written two books about protocols underlying the internet, helped explain some of the implications of this idea. Large volume cyber attacks are a different story though. One famous international example was in 2007 when the nation of Estonia removed a Soviet war memorial, which enraged Russians. A wave of cyber attacks subsequently hit Estonia disabling the websites of government ministries and a number of other industries. Recently, similar hacks between China and Vietnam have seen nationalistic images and phrases posted on government websites of both sides because of the South China Sea territorial dispute. These attacks could indeed be prevented with independent internets. So in this sense, it is a viable solution for cyber warfare. But it would basically be killing cockroaches with dynamite. Setting up the network infrastructure of an independent internet would be easy enough technically because, in a nutshell, it would only require leaving out the international connections. But this would immediately cause some practical problems. There will always be systems that need to connect to both the independent network and the global internet. The Domain Name System (DNS), which translates IP addresses into domain names, needs to have a foot in the international web to function in its present form. Some kind of a bridge linking the systems should be possible, but even if that was worked out, there would be bigger problems. If Chinese internet users had foreign software like Windows, they couldn’t receive updates on it. Anything outside China’s borders would become inaccessible which would have serious economic and communication consequences, effectively killing the internet as China knows it. Similar proposals have been made in Iran and Russia, but they face the same practical problems, which is probably why they haven’t gotten off the ground. While cyber security may be a legitimate concern, if the Chinese people were to actually experience being cut off from the international internet, it wouldn’t take long for that 90 percent support to plummet. Whether or not this is something the Chinese government is seriously considering is anyone’s guess. I contacted the reporter who wrote the Global Times article and she didn’t know why the survey was done or any other information beyond what she wrote. I was also assured by a different Chinese reporter friend that if this was indeed something under consideration, everyone involved on both the government and technical sides would be sworn to secrecy until some kind of an official announcement was made. But the fact that the poll was carried out shows some people are thinking about it, and it’s hard to imagine the government hasn’t entertained the idea. Now, I’m sure this hasn’t even crossed their minds, and it may hardly be worth mentioning, but there is another implication of an independent internet. “It would certainly make life for censors easier as they don’t have to block sites on a case-by-case basis now that everything is blocked,” Beijnum said. But using national security concerns as a cover for enhancing censorship capabilities in this way would be a desperate act by a paranoid regime, and downright dishonest. Fortunately, that would never happen in China. This summer I had the daunting task of moving across China. Having already lived in China three years, I had accumulated a treasure trove of souvenirs, gifts, cheap clothes and a host of other things that stretched well beyond the capacity of the two suitcases I arrived with. I’m not the type to easily part with anything so moving involved much more than simply buying a train ticket. So for those of you who also must face the challenge, here is a step by step account of how I did it in what I believe is probably the most painless and inexpensive manner. 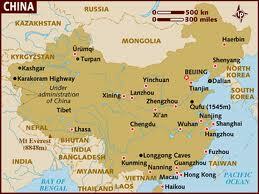 My move was from Nanjing to Beijing; a distance of about 1,000 kilometers (600 miles). In the USA where I’m from, usually the best solution in this situation would be to hire a moving company or rent a moving truck, so this is what I looked into first. But every Chinese person I asked thought this was insane. For a cross-town move this would be okay, but cross-country… you may as well burn your money. Using the highways alone, which are notorious for having an overabundance of toll booths, can set you back a couple thousand yuan for a cross country trip. There are a few well known moving companies as well as mom and pop operations with a single truck (these are usually cheaper). I’ve heard you can ride along with the driver and save yourself a train ticket (as well as keep an eye on the goods), but still…you’re looking at paying several thousand yuan. Maybe not bad by American standards, but the way I moved had a price tag that never cracked 4 digits. I mailed most of my stuff, and more on that later, but first I had to get rid of the crap I didn’t feel was worth bringing and the stuff that was too big. In China, it’s never hard to unload extra stuff…and you can usually make money on it. For my bigger things (a couch, electric scooter, shelves, etc.) I first went to my foreign friends. I was lucky to be teaching at a university with several teachers who were staying on another year so I took pictures of my things, emailed them to every foreign friend I had staying in town and auctioned them off. I listed the price I bought each item for and let them bid with each other. I sold nearly all my big things this way among my pool of eight foreign friends with roughly a 50% return on what I originally paid for the items. For the smaller things I didn’t feel were worth bringing (old books, clothes, various knick knacks) I was able to sell to Chinese students. Again, I was lucky to live at a university at the end of the school year so there was a 3-day “market” set up for leaving seniors to sell their stuff. I’ve heard this is almost universal at universities. For 15 yuan I rented a space in the market. Luckily, I had a Chinese girlfriend who helped me with this, but it wouldn’t be hard to hire a student (or ask one nicely) to help you. I sold about 80% of my remaining “worthless” stuff this way. I came out with about 300 yuan…not much but good for stuff I was going to throw away anyways. The remaining 20% of my stuff I left on the curb and it was gone within 5 minutes. This was for stuff that wasn’t fragile or important. This included the bulk of my things. China Post is the official post office of China and they have branches nearly everywhere. To mail a lot of stuff you have to use a special bag which you can kind of see in the picture here. This bag can be a bit tricky to find. Some China Posts sell other bags you can use, so try asking first. The CP I used didn’t have them so I found mine at a big market that specializes in home furnishings. The bags zip up nicely, but they aren’t especially durable so don’t pack them to the brim (like I did). “Dangerous” liquids – This included cleaning solution, alcohol, vinegar (? ), any container that might break or leak, and anything that didn’t have a Chinese label (because the inspector couldn’t read it). Sharp things – I did send numerous knives that were safely enclosed in a plastic box. The inspector never saw them though so I’m not sure if they’re technically allowed. Paper that was written or typed on – You can send books, but not anything you have written or typed yourself. This is because they don’t want you sending things in bulk rather than sending letters the conventional (more expensive) way. This part was the most annoying as I had years of class notes I wanted to send. These things seemed totally subject to the whims of the inspector and I’m sure it’s not all inclusive. The inspector got impatient and inspected the last few bags much more laxly then the first. When I noticed this I just wrapped some of the things listed above inside clothes and put them in the last bag. She never noticed. Finally they weighed all the bags and for the whole lot of them (which together weighed over 200 kilograms) I paid 450 yuan. This varies based on the distance they travel. There’s a tool here you can use to calculate the cost by putting in the weight and the zip codes of the cities you’re going between. They told me it would take somewhere between a week and a month to arrive in Beijing, but to my surprise they arrived 3 days later! My guess is that the bigger the load you send, the faster it gets shipped out. Also Nanjing to Beijing has to be a fairly common route, so don’t count on this happening. When the bags arrived most of them had tears in them and a few things were broken. One bag was inexplicably wet and had almost fallen completely apart. But nothing of any real value was damaged and nothing was lost. You can buy insurance for 1% of whatever you claim the total value of the goods to be and in theory you could get reimbursed for any damage or losses, but if you have anything they deem breakable (which included several things including a bicycle helmet) they make you sign a liability waiver or they won’t let you ship it. So really the only way you could collect on this is if they lose the bags completely. 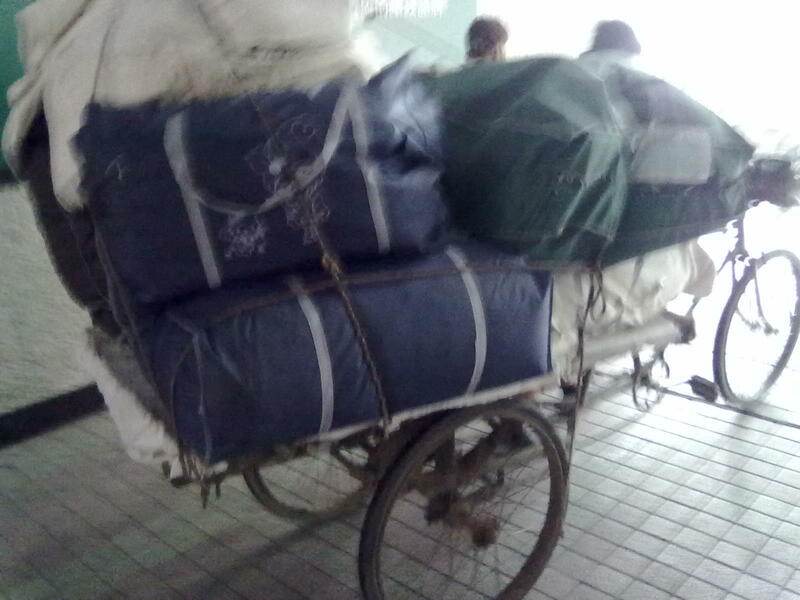 When they arrived, I hired a rickshaw guy (pictured above) for 20 yuan to take all the bags from the Beijing China Post to my new apartment…which he miraculously did in one trip. This I would recommend for breakable things or large, irregularly shaped things. For me this included a printer, an oven, and a workout bench (pictured to the right). This way is significantly more expensive, but you can be fairly confident that your stuff won’t get broken. 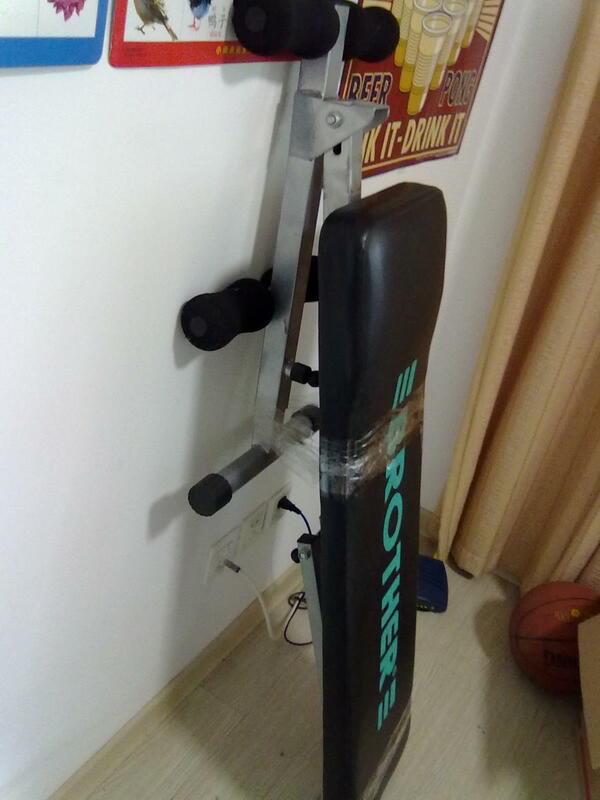 It’s also the only way to send some things since China Post wouldn’t send my workout bench. It cost 10 yuan for the first kilogram and 8 yuan for each subsequent kilogram for my shipment, which for these three items ended up at about 200 yuan (most of which was from the workout bench). You can often bargain though. The nice thing about this arrangement was that the company picked up the stuff from my Nanjing door and delivered it to my Beijing door. They also spent a fair amount of time packing everything up nice and tight (which cost an additional 10 yuan). The stuff was shipped by air and arrived two days later. The company I used was STO, Chinese name:申通(Shentong). But there are many others. This method is somewhere between the last two in terms of price and care. The only things I sent this way were two long distance cycling bicycles. They would have been too expensive to send through a private company and China Post wouldn’t send them. Nearly every train station has a service where you can take your items to the train station and they put them in a cargo car of a train going to your destination. If you’re taking a train there yourself, sometimes you can get the stuff put on the same train as you, but usually you have to go back and pick it up later. Bicycles were a flat rate of 70 yuan each no matter the size. Other items you can ship are similar to China Post. They charge by the kilogram and there’s a host of things they refuse to ship. I wanted to ship my electric scooter, which they said they could do, but it couldn’t have the battery, nor could I bring the battery with me on the train so I opted just to sell it. The bikes arrived the next day with several new scratches, the chains unshackled, and one unimportant piece chipped off. So this method isn’t especially safe, but probably better than China Post. Here’s a tool you can use to calculate rates using this method. Definitely more expensive than China post, but if you absolutely need to receive your things quickly in the new city or have certain big items, it’s not a bad choice. For smaller fragile things, I packed them in my two big suitcases and took them on the train with me. This included an air purifier, hot plate, humidifier, and various small breakable items. There’s no limit to how much you can take on the train, but you may have trouble finding a place to put it if the train is full. When all was said in done, shipping everything was about 800 yuan and my train ticket was 120. From the first day I started sending things to the day I had everything in my new apartment took four days. It was a terribly busy and laborious four days, but that’s the price of saving money I suppose. A lot has been written online about how to find an apartment in China so I won’t beat a dead horse. If you’re moving to Beijing here’s a site that gives some great advice – I’ll give a few key pieces of advice though. If you’re a foreigner you are going to pay more. When my Chinese girlfriend and I went together to agents, we noticed the price was very high. Then when I stopped going with her the price miraculously fell. When we finally found an apartment, the landlord told her directly that we were smart to do that. He would have definitely charged us 200 yuan more per month and not a penny less. If you have a lot of time you’ll find a much more reasonable place – We were on kind of a time restriction so we had to find an apartment within a week. We got so frustrated and tired after looking in the July heat that we settled for a place after 3 days that cost 400 yuan more per month than our original maximum budget. So if you take your time and visit lots of places and call lots of numbers, you’ll find a much better deal. Agents have no souls – Maybe a bit unfair to say this, but our experience with agents was not good. The apartment we ended up renting was advertised online for 3000 yuan but when we met the agent to look at it, he told us the real price was 3700 and that they only put that online to attract people. In the end, my girlfriend bargained it down to 3400. Many agents told us outright lies which were obvious (Ex: “It only takes 10 minutes to ride your bike to Tsinghua.” When it obviously took more than 40). Most agents are usually paid a full month’s rent for their services and it’s usually paid by you. The agency we used was Century 21. They were paid a flat fee by the landlord of about 2000 yuan which was much less than most agencies. But again, they weren’t exactly trustworthy. If you have the time to call random numbers you see posted, you’ll probably get the best deal that way, but you also don’t know what you’re dealing with in terms of the landlord. At least with an agent you have some recourse if the landlord is awful. So there it is. It was the worst few weeks of my life but looking back, I’m glad I did it this way rather than splurge on a moving company. My experience was made infinitely easier thanks to my girlfriend so if you have a Chinese friend who can help you or you speak good Chinese, this will make the whole process much much easier. Feel free to contact me or post in the comments if you have any questions. Good luck!